We’ve all been there: money is a bit tight, you need a trim or a freshen up of your look – but instead of waiting until you can afford to book an appointment at the most popular salon in town, you swing by Supercuts and hope for the best. I spent many years on a budget and didn’t quite understand why anyone would chuck fifty quid at a hairstyle, particularly when you could get one for a fraction of that amount. Cutting hair is cutting hair, right? How wrong can you go? The answer is very, and the proof is below. I would put money on the fact that almost every one of us has experienced a bad haircut at some point during our lives, whether that’s a salon completely getting the wrong idea about what you requested, chopping off too much, adding layers when you specifically asked for none, dying your hair a funny colour or (even worse) slicing your ear with a pair of scissors. I like to put it down to experience, but that doesn’t make it ok. It’s about time we stopped accepting bad haircuts and disastrous salon appointments as just part and parcel of what we have to go through en route to our ideal style – and here’s a little story to explain why. of the look she was after, she sat back and awaited her mini makeover. Christmas present with more foresight than I realised!) 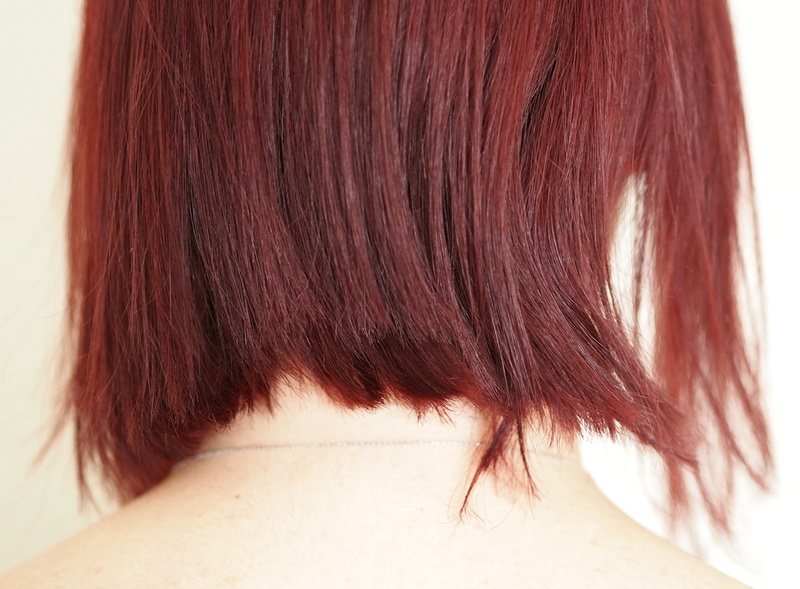 Because of the horrendous cut she was left with, the salon that fixed it had no choice but to cut it even shorter and completely re-style once again; although it does look fab and Gemma suits short hair as much as long, it’s been an expensive and traumatic experience – as well as somewhat time consuming. Supercuts have now offered an apology, refund and will be covering the cost of the re-style elsewhere, but this is not a stand-alone incident. I’ve been tweeted endless stories of incompetence, rudeness, violations against hairdressing and even sliced ears! Here is just a selection, for context, alongside a couple of pictures of Gemma’s ‘do after the Supercuts stylist had mangled it. “Popped in there for a trim a few years ago; I left with one side longer than the other and weird long bits in the shorter side. NEVER AGAIN”“They cut my fringe once when I had it and it was HORRIFIC. I was disgusted with it.”“A year ago today they highlighted my hair and burnt my scalp so badly it has never recovered!” “I had the worst cut of my life at Supercuts! I went from all one length to having a blunt asymmetric layer by my eyes.”“Supercuts in Swansea once cut my friends ear with scissors. He bled down his top and asked “did you just cut me?” They said: ”Oh no that must be from your piercing””“Supercuts are awful, I had the absolute worst time there recently. I was very close to walking out. attached to your head every day for the next three months? coloured strands. We only have one head of hair and it’s not like you can change it once it’s cut – the only option you’ve got it tying it back or popping on a hat until it grows out. I’m a firm believer in investing in your beauty regime as far as your budget allows. I fully understand not everyone can afford to or can justify spending a lot of money on their hair, but I would always recommend going to the best salon your budget stretches to if you want anything more than a trim. 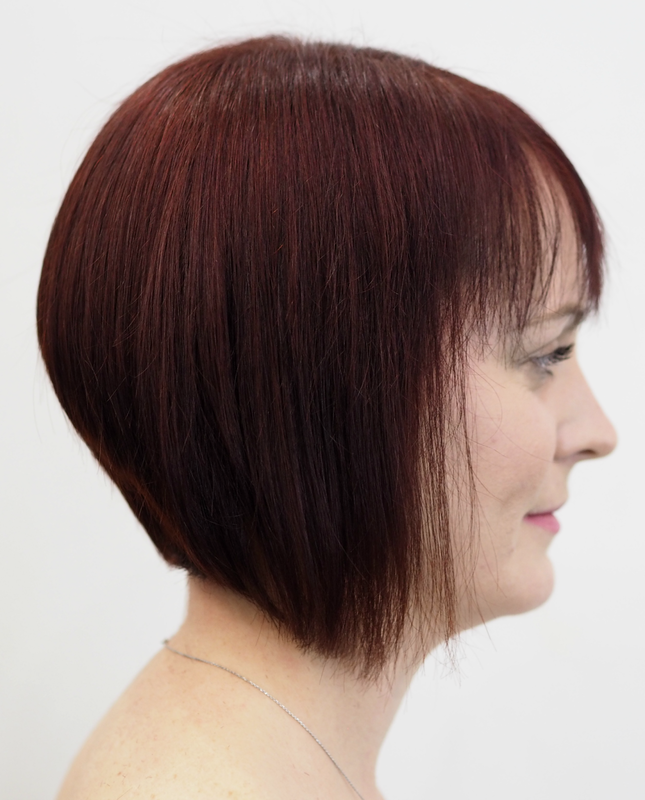 Although Supercuts undoubtedly serves a purpose and is adequate if all you need is a basic tidy up, if you’re asking for anything more complex then it’s worth finding a salon and a stylist you can trust – because I don’t want any more of you to end up like Gemma. What’s even more worrying is the tales I’m hearing about expensive treatments being added to Supercuts bills without the clients knowledge or permission. Gemma herself didn’t realise she’d been charged for a hair treatment until it was itemised on her bill, and this is a story I’ve been told many times both on Twitter and by stylists working in other salons. One reader told me: “I had a cut and blow dry, but during the wash the stylist told me my hair looked really dry so she was going to add a treatment to it. When I went to pay I was shocked to find the ‘treatment’ had actually bumped my bill up by £25! I was never told it came with an additional charge, and would never had agreed to it if I was.” This is not ok. You should absolutely be prepared to pay extra for additional treatments, but you should also be made explicitly aware of the cost associated with them so you can make an informed decision; it is absolutely unethical and unacceptable for stylists to be adding these treatments on to bills or quoting with a treatment without explaining the breakdown of the cost. It’s my understanding that Supercuts stylists earn a commission on these additional treatments, but bolting them on without the knowledge of the client is simply bad business practice. What are the chances that a poll with over 300 responses would come out exactly 50/50?! 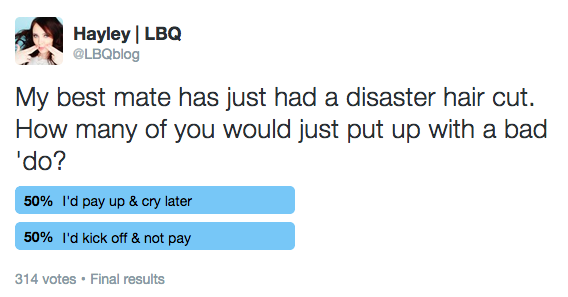 Although I’m pleased to see that half of you would be prepared to say something, refuse to pay and point out when you’d not been provided with the service you thought you were paying for, I’m also concerned for the half of you that would just smile, pay and walk away. So if you’re one of those people that have admitted you’re maybe too intimidated or unsure of your rights, if you’re unhappy with your haircut here’s what you can do to hopefully rectify the situation. 1. Before you leave the salon, always ensure they show you your new look from all angles. If it’s a re-style, ensure they blowdry/straighten and add styling products so you can see what it should look like when fully prepped. Don’t ever leave without being fully aware of what they’ve done. 2. 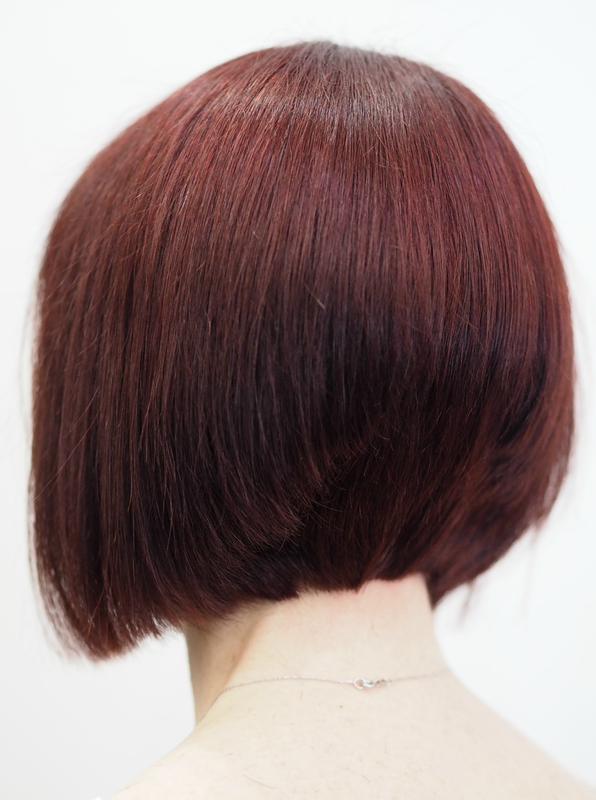 If there are elements of your cut or style you’re not happy with, politely point them out to the stylist and ask if they can re-look at particular areas. Any good stylist wants to showcase only their best work and will prefer to tinker than to leave you unhappy. 4. Don’t be afraid to ask for additional support or aftercare – most reputable salons will offer this free of charge. If you can’t get your style to work at home, ask if you can pop back in for a mini consultation and request specific advice on styling and products. 5. If the worse comes to the worst, ask for a full refund. Hairdressing is a service like no other, so if you don’t get the service that was advertised you’re entitled to ask for your money back. If they refuse, you can take it further by either contacting their Head Office, speaking to an area manager, using social media or even contacting your local Citizens Advice Bureau. More importantly, how can you find a great salon to start with so you don’t have these issues? If you can, always go off the recommendations of others – whether that’s someone you know, comments in a forum or feedback being left online. There are tonnes of websites and apps that help customers make good decisions (including Treatwell and The Good Salon Guide) and minimise the risk of getting a horrendous ‘do. Don’t ever think you can opt for a bargain and get the same level of service; expect to spend a significant amount to get the results you’re after, even if you have to scale back how frequently you can enjoy that experience. And finally, ask for a free consultation to understand whether the stylist truly understands what you’re after and that they can achieve it with ease. You should be developing a long-term relationship with a stylist that ‘gets’ you and creates a look you’re more than happy to walk out with, rather than leaving you embracing the bobble hat when it’s not even cold. My final words are this: please, please, if you can help it, don’t go to Supercuts. I’m yet to hear a single positive thing about any of their salons across the UK, and their social media accounts are full of tetimonies that are similar to the ones above. 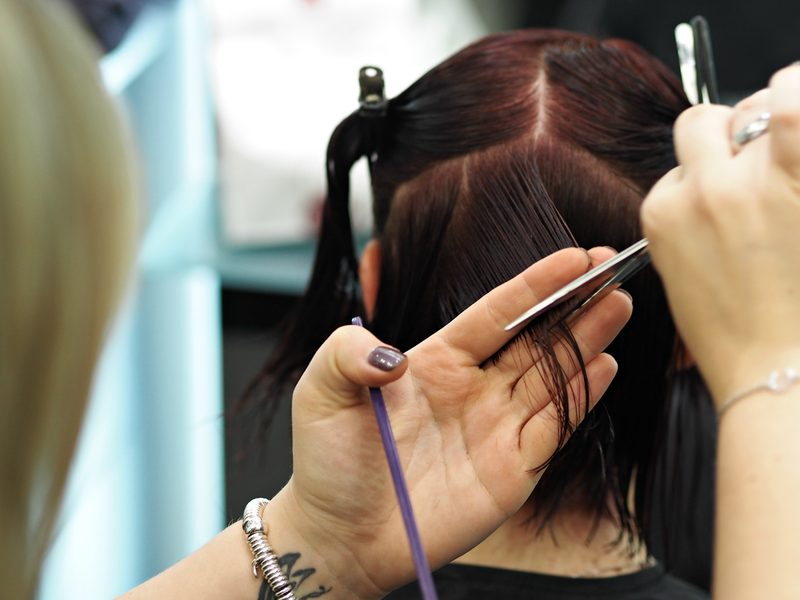 Although I’ve no doubt that many of their stylists are skilled and offer their clients a great service, the overwhelming opinion is that the majority need some training – in hairdressing, customer service and business ethics. They’re giving an industry I have a lot of love for a bad name, and women across the country bad hair cuts. And I simply can’t abide bad hair cuts. Have you had an experience with Supercuts, positive or negative, that you want to share below? I think you're probably safe for a trim, but not much else! As a young teen I really wanted a hairstyle I saw in a magazine (choppy short bob) so my parents took me to a high end salon who made no attempt to adjust the cut for my hair type and I walked out with a horrendous hair cut that was basically a short mullet. Last time I trusted a "proper" salon. Took my mum months to get me back to the hair dressers and years before I let a hair dressers cut more than an inch. I'll stick with my local family salon (who actually charge about the same as supercuts) and avoid those designer rip offs that just want to do "fashion" hair. Don't tarnish all hairdressers with the same brush, but also, I totally understand your experience. Like I said, do some research and find salons that work for you. Luckily she really suits short hair, but it was really long and all one length before they got hold of it! I've never been to Supercuts but have had bad if not worse at higher end salons. I once has my stylist I'd been seeing for close to a year shave all my hair off. True story. Didn't see another hair stylist for close to 3 years. I finally found one and was seeing her twice a week for 2 years for blowouts. She had done a bayalage in January that was amazing. Had one scheduled for September and she died my hair orange! This was a person who knew me and my hair very well since she had been the only person maintains my hair for two years, twice a week and still messed it up. I got a refund and never went back. Always speak up no matter what type of place you go to. I'm still on the hunt for a new salon because I've always had someone take care of it because I can't deal with doing it myself. Why on earth did she shave your hair off?! See, I've had pretty good experiences at Supercuts, both in Bath and in Birmingham. The one time I tried a slightly more expensive place (well, twice actually) my hair was so badly damaged. It was like the hairdresser had no idea what to do and the heat atyling she did made my hair feel like straw. It's always a gamble I find. I have had a few bad experiences at different hairdressers over the years. It doesn't seem to matter how much I spend nobody ever seems to be able to cut my hair properly. It always puts me off going again and I never feel confident enough to complain. Your friends hair looks so much better now and it really suits her. I take my 6 year old to Supercuts and though they're always a little cold they get the job done. 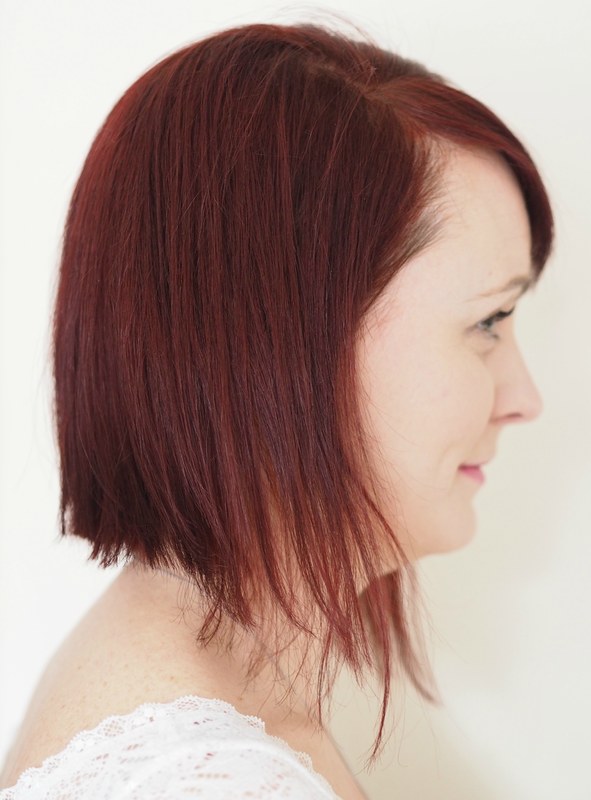 I'd never go myself though – I've been going to the same stylist (Sam) at the same salon (Ena, Covent Garden) since 2012 and the couple of times I've tried elsewhere it's been disastrous. Notably I left SAKS feeling like I had Princess Di hair this time last year (I'd asked for a lob with movement)… never again! Ena is not cheap but it's SO worth it. I've used super it's a few times and never actually had a problem. The girls in Chelmsford branch are actually really good. I went from long hair to a fringed Bob and it was a great cut. Worst haircut I've had was in a much more expensive salon though I can't remember the name as it was so long ago. That Salon has closed now! Very telling?